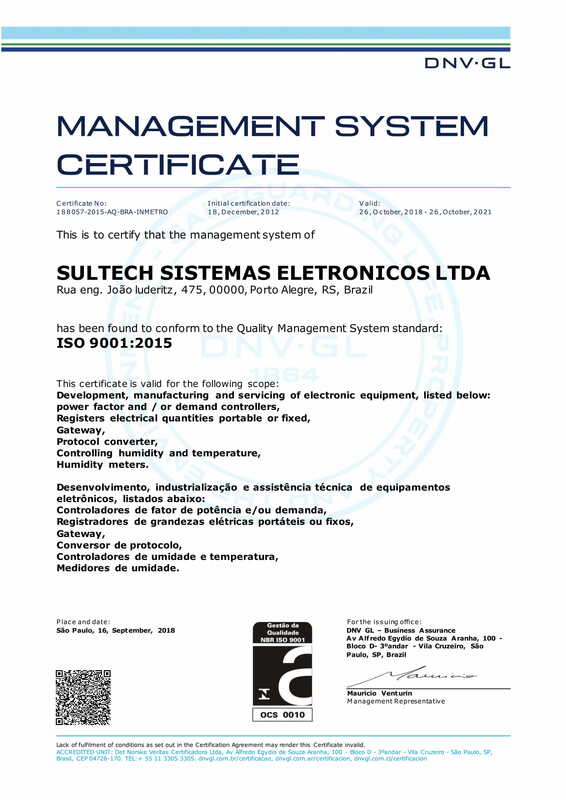 Sultech is a Brazilian company with 26 years of experience in the development and manufacture of solutions for energy efficiency through equipment for management, supervision and control of electric energy. Its product line allows the precise monitoring of the quality of the energy used, optimizing its application, maximizing results and generating confidence and credibility. The company focuses on its customer, always looking for the excellence of its products and services and, therefore, has ISO9001 Certification, which guarantees a high level of quality and safety to the user. Sultech assist its customers in a variety of segments: electrical equipment dealers, electrical project designers and installers, industry, energy concessionaires, electrification cooperatives, shopping centers, smart buildings, sanitation, oil and gas, among others, and has thousands of equipment installed in Latin America. Our strenght, in addition to the quality of the products, is in the highly specialized team that has a wide control over the manufactured equipment, which allows flexibility in the personalization, agility in the delivery and excellent support in the after-sale. In addition, our products are integrated with the majority of the equipment in the market. Investing in Sultech solutions means investing in energy quality, efficiency and peace of mind for your business.